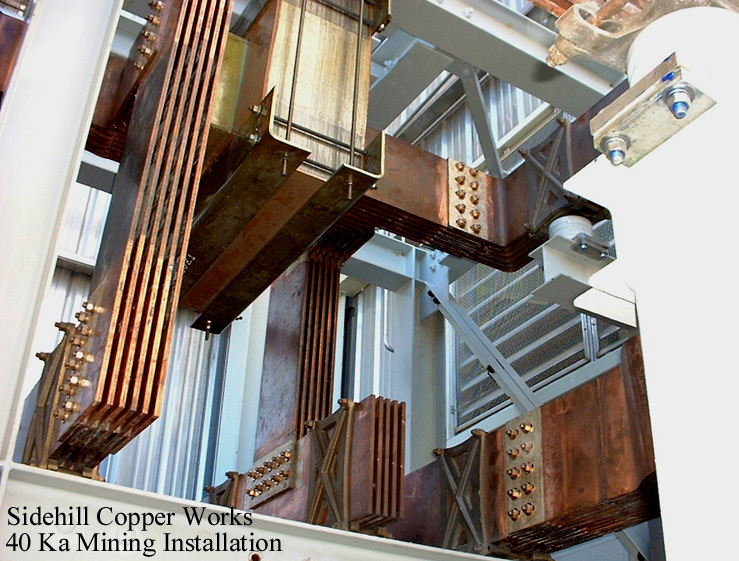 Sidehill Copper Works, Inc. specializes in the design and manufacturing of high current, low voltage, open DC busbar systems and fabricated components for heavy industrial electrical applications. Our expert engineering staff is experienced in the design, fabrication, and project coordination of a wide variety of bus system applications within the USA and internationally, such as copper SX/EW and refinery projects, steel electrogalvanizing, DC mill drives, and electrochemical projects such as chlor-alkali, fluorine, metal finishing, and others. Our shop fabricators have years of practical know how in the machining, forming, and welding of copper bar and plate products for electrical applications. Our office and manufacturing facility is located in Erie, PA approximately midway between Buffalo, NY and Cleveland, OH. - 125 miles north of Pittsburgh, PA.
Click here for a one page summary of Sidehill Copper Works, Inc.